As I mentioned in a previous post, a short news item on the "Goliath Inscription" appeared in the most recent issue of Biblical Archaeology Review. As promised, I have waited till I read it to add my comments (thanks to Jeff Chadwick, BYU, Area Supervisor of Area F for sending me the text before the actual issue arrived in Israel). The oldest Philistine inscription ever discovered was recently excavated in Goliath's home town of Gath (Tel es-Safi) by an expedition headed by Aren Maeir of Bar-Ilan University. The inscription was scratched with a needle-like instrument on a small pot-sherd and dates from the tenth to mid-ninth century B.C.E. Of the two names on the sherd, the first consists of four Semitic letters: TWLA [Hebrew font, alef-lamed-vav-tav], which Maeir says may be the equivalent of the name Goliath. Although it was written with Semitic letters, the name is apparently Philistine. The Philistines were a people who originally came from the area around the Aegean Sea, and who probably spoke an Indo-European language, possibly similar to ancient Greek. When they migrated to the coast of modern Israel, they gradually adopted aspects of Semitic culture, including the alphabet, but retained their own Philistine names and some aspects of their Philistine language. Maeir stresses that the Goliath of the inscription from Gath is not the Biblical Goliath. Most scholars regard the Goliath story as legend rather than history. The inscription does, however, give a real-life context to the story, and it demonstrates that the name Goliath was probably in circulation in Gath about a century or so after the legendary battle between David and Goliath, according to the Biblical chronology. 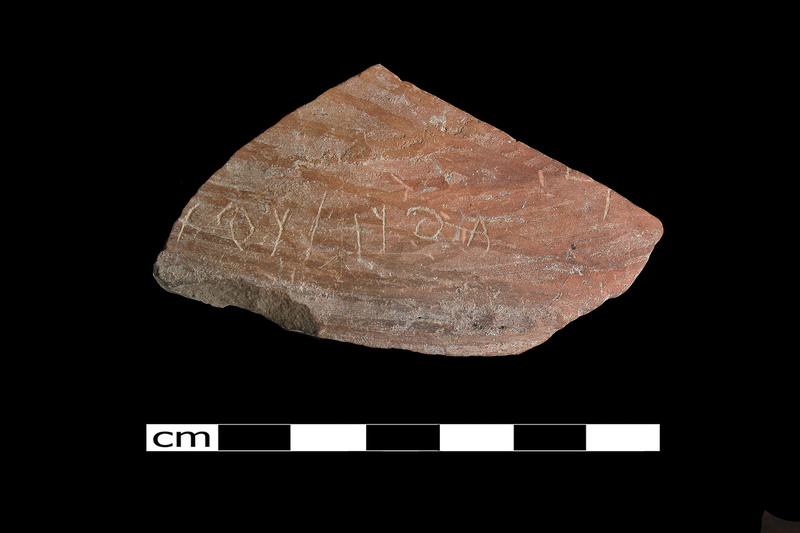 TWO NAMES scratched into a small sherd of pottery are all that appear in the oldest Philistine inscription ever found. Though the names are Philistine — the one on the right may be the equivalent of Goliath — the letters themselves are Semitic, thus demonstrating that the Philistines (a sea-faring people from the Aegean) absorbed aspects of Semitic culture once they settled on the coast of modern Israel." 1) The stratigraphic context of the sherd dates it to the 10th to the early 9th cent. BCE. 2) The sherd is a type that is typical of the 10th-9th cent BCE, both at Safi and at other sites. 3) BOTH names that appear on the sherd (AWLT and WLT…) are etymologically very close to Goliath. All are quite similar to Indo-European, names such as Lydian Wylattes/Aylattes, which in the past have been etymologically compared to Goliath (way before this find). 5) It shows, quite clearly, that the Proto-Semitic script was still in use in the 10th/9th cent. BCE. 6) Bottom line: 1) the inscription demonstrates that ca. the 10th/9th cent. BCE, names very similar to Goliath were in use at Philistine Gath. This does provide some cultural background for the David/Goliath story; 2) that already early in Iron IIA, the Philistines adopted the Semitic writing systems. Our blog has the interest of the world press! This blog-idea is phantastic! Congratulations! And dash ham to all the Safians (Gittites). I still see an option that the W might alternatively be Y, although W is more probable. And, shouldn’t “Aylattes” actually read: “Alyattes”? That at least is the classical form. When Larry Stager lectured to us at last year’s season about Ashkelon, he showed two inscribed sherds: one Egyptian hieratic, the other with an Aegean type script that, he said, was classified by F.M. Cross (I think) as “Cypro-Minoan”. Does anyone have any substantial information on that particular sherd? If there is any inscription that we have any reason to believe it could really be Old-Philistine, then it is this one. Dash-ham to all the Safians (Gittites)! For the Ashkelon ostracon and jar handles, mentioned by Stefan, see the article by Cross and Stager, “Cypro-Minoan Inscriptions Found in Ashkelon,” Israel Exploration Journal 56 (2006):129-159. Could this inscription not be a reference to the Biblical event described in the Biblical account, written later on a piece of pottery? If this event was historical, and not just ‘legend’, it could have been passed down to later generations via writings, and could have ended up on a piece of pettery, in just the same way that we drqw pictures of Pearl Harbor, or whatever. These are not the name of Goliath. At most, and then even so with severe qualifications, names that may be somewhat similar to Goliath. More likely, they are Indo-European names, as the name Goliath. In any case, it does not mention THE Goliath. This discovery at Tel es-Safi is extremely interesting. However, one of the most interesting possibilities is what is not being discussed: discontinuation of funding sources for Dr. Aren Maeir’s future research projects if he connected his find to the Goliath of the Bible. Such funding issues are ‘felt’ by you, they can’t be ‘known’ for the purposes of plausible deniability. Sorry Deane but there is not a grain of truth in this issue. It is very hard not to be cynical when you observe for a while. Too many ‘no evidence for’ or more often ‘lack of evidence for’ equals ‘evidence against’ type false conclusions around for my liking. Too many strong conclusive ‘not’ statements that lack reason as to why not. Especially when it may contravene more recently popular world views. is a pretty strong statement of fact. No ‘probably does not’ there nor reason offered for the conclusive “does not” claim. Don’t mean to be rude if you have reasons for your views. but the patterns out their are tiring and too hard to miss. Dance all around evidence of the Bible’s accuracy but deny at all costs admitting it or even better find an obscure shaky explanation as to why it is not true. Looks like open minded till you read the repeated reports that lack basic reason. Another let down for the desperate myth believers…. Great! No sense in getting into an argument over the details. I suggest you read the full article, with a full discussion of the inscription, its meaning and its relationship the biblical name Goliath, which should appear in BASOR within a month. Maeir, A., Wimmer, S., Zukerman, A., and Demsky, A. 2008. A Late Iron Age I/early Iron Age IIA Old Canaanite Inscription from Tell Es­-Sâfi¦/Gath, Israel: Palaeography, Dating, and Historical-Cultural Significance. Bulletin of the American Schools of Oriental Research 351:1–31. I agree…no sense in getting into an argument. I’ve just grown cynical of some of the cynics and am probably fairly (too?) happy to suspect it is wishful conclusions rather than certain ones when I look behind the headlines so to speak. No insults intended with my suspicious standpoint. Q: how does the :alef get replaced/supplemented with the gimel ? This is discussed in detail in our forthcoming article in BASOR (should be appearing any day now). Extremely useful info specifically the ultimate phase :) I handle such information a lot. Hi there exceptional website! Does running a blog such as this take a large amount of work? I’ve virtually no knowledge of coding but I was hoping to start my own blog soon. Anyways, if you have any recommendations or techniques for new blog owners please share. I understand this is off topic but I simply needed to ask. Many thanks! Goliath had a son called Goliath as well. Mariona Vernet suggests a Carian derivation in her paper The etymology of Goliath in the light of Carian PN Wljat/Wliat: a new proposal. If so, the name would mean ‘strong’ and be related to the word for lion.